This picture of Justice Ruth Bader Ginsburg with her head lowered went a bit viral during President Obama's State of the Union Speech. 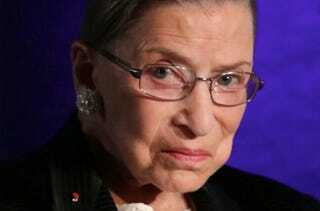 That picture was not shot tonight, we know because RBG was wearing her Blue Egyptian Queen necklace tonight. Erin McCann gives us a side by side comparison. Here is another shot of Gins from 2013's SOTU. It seems like a pretty natural pose for an 80 year old woman with osteoporosis. This night session of Shade Court is closed. See you on the moon, assholes!